Hello. Welcome to this free on-line guide to Crystal Wand Massage. By getting here you now have an opportunity to improve your well-being and the well-being of others. You can improve your health. You can improve your outlook on life and you can easily help others to feel better, move easily with less pain, and enhance their daily lives. Now wait.... Keep reading. You can do this. You do not need special training. You do not need special facilities. You do not need experience to get started. You will really enjoy the experience and..it will make magic in your life and in the lives of others. Really! Read a bit more and see what you can do easily at home to really help yourself and others feel better, truly relax, have more energy, be more radiant and beautiful, and keep the negativity of others from affecting you. You can reduce pain and increase the level of wellness in those around you. You can spread a little comfort and joy wherever you go. You can actually do good things for others in a way that is pleasing and actually quite easy. Crystal wand massage will do all of this for you. And, we are so confident in your ability, we offer a very simple guarantee - if you are not completely satisfied that all works as we say - we will refund every penny you might spend with us. But note -- you do not have to buy anything from us. So how can you achieve all this incredible wellness, increased joy, and lower pain? The answer is Crystal Wand Massage - and it does not take a degree in massage therapy. You can learn all you need with this guide and the material in our starter kits. Using our starter kits you will learn techniques, gain understanding, and see results fast. And you are really going to be glad you walked down this path to wellness and vitality through crystal wand massage. So let's get started and answer some basic questions. First, what is a crystal massage wand? A crystal massage wand is a fashioned rock, mineral, stone, or crystal that is usually about the length of a pencil. It is normally rounded on one end and pointed on the other. 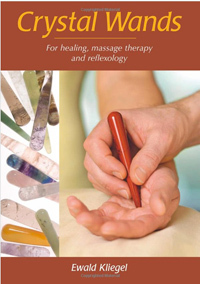 For the purposes of crystal massage and crystal reflexology they must have a smooth rounded end and a pointed end. For only crystal massage work, wands with only rounded smooth ends can be used, but they will need to be augmented with others having a sharp point. 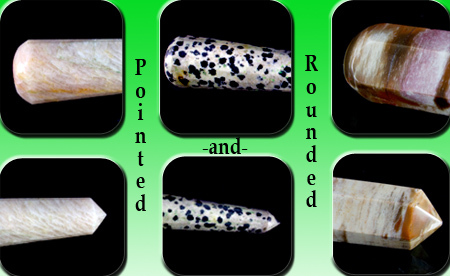 Some wands are made as a smooth, rounded or sometimes tapered cylinder. They do not need to be tapered, but many users seem to prefer that design; it is a personal preference. Also, some wands are faceted along their length instead of being a smooth cylinder. Again, we know of no issues or limitations with either design. Some wands are round, and some are a new hand held shape. And there are twisted ones too. There are quite a variety, and you will find some you really like. Please note that crystal massage wands can be called stone massage wands, or mineral massage wands - they are all the same tools- just different names. The important point is that they are made from different minerals, rocks, and crystals - each with its particular energies and healing purposes. Don't worry, you do not have to memorize anything. All our wands are very specifically described in their individual listings. You can learn a great deal about each crystal and mineral from the listings. But there is one point worth making right up front: Aesthetics matter! What we mean is that function follows form. You must use wands that are well made and natural. They must feel right in your hand. They must be well polished and be pleasing to your eye. They must please your senses or they will not be effective in pleasing or healing others. And here is a very important note: the pointed end of the wand must not be too sharp! It should be rounded a bit, and smooth to the touch. If you have one that is too sharp it will be uncomfortable to your patient. Some inexpensive silicon carbide sandpaper from a hardware store can be used to smooth the point of a wand should it be made too sharp. Why are there so many kinds of crystal massage wands, and do I need more than one? There are many types for two reasons. First the artist near where a certain mineral is mined will naturally make wands from the nearby source. Now, with the rise of world trade, many different kinds are available worldwide. The second reason is that each mineral produces a wand with unique energies. Having an assortment of crystal wands will allow a crystal wand massage therapist to bring the right energies to a patient. Again, the metaphysical healing energies, and uses of each wand is explained in its individual listing. In addition our Crystal Metaphysical Encyclopedia which is growing daily has incredibly extensive discussions of the healing properties of many crystals. The second part of the question is answered with a cop out phrase "It depends." Yes you need more than one when you intend to deal with a variety of patient needs. But no, you could get by with just one if your intentions are limited to the capabilities of a single wand. What is Crystal Wand Massage? Now it is time to give credit where it is due - Ewald Kliegel and Michael Gienger have brought us this amazing therapy. Their books published by Earthdancer are the definitive sources. They are our "textbooks." We certainly recommend them to you. They are invaluable. The good thing about these books is that they are full of clear pictures and guides. They are written to make the techniques easy and effective. Now you can test out the benefits even before you buy a starter kit so you will know you will be successful with crystal wand massage. To try it out, you can just use the information here on the Crystal Vaults website. It is sufficient for you to experience the seeming magic of this therapy. But we can only just introduce you to the possibilities. Once you experience the amazing results, get one of the starter kits. Ok, this section started with the question, "what is crystal wand massage?" Let's answer it. Crystal wand massage is using the energetic qualities of a particular crystal in a massaging action using either the rounded or pointed end of the wand to soothe, relax, align, or energize a particular part of a person's body - either yours or someone you are helping. Now there are some real advantages here over traditional massage techniques. One of the big ones is that your hands do not get tired! Traditional massage puts great stress on fingers, hands, arms, and shoulders. Using a crystal wand avoids the strain and stress. Secondly, the wands will focus the Universal Life Force with their unique energy structures to amplify or dispel energy depending on how they are used. Results will be faster and more long lasting than regular massage techniques that do not bring the amplifying power of crystals to the healing. Finally, the crystal wands will allow for a wide variety of healing therapies with very little investment or re-learning. The crystalline energy matrices of the crystals will allow you to tailor a massage easily and effectively. In short, crystal wand massage offers a stimulating, or relaxing, healing capability with only a few necessary crystals and a bit of practice. From experience I can tell you one thing - you will never regret trying this - you will feel better, and you will have a lot of family and friends waiting in line for you and your crystal wands. Oh, I did tell you earlier that we would prove this works, so let's get on with it. First here is a quick test to make anyone believe in crystal wand massage in less than a minute. 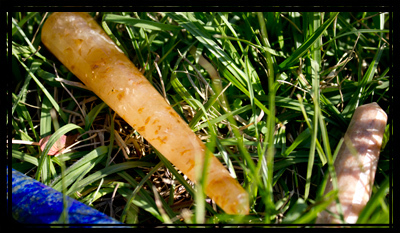 Get an orange calcite wand. Have them sit upright in a straight back chair. Standing behind them have them close their eyes. Gently draw what we call the "electric question mark". Holding the wand like a pencil start with the pointed end lightly touching one of their cheekbones. Slowly move the wand up over their ear and down the side of their neck ending up at the base of their neck. Pause and repeat on the other side. You will have a believer immediately. Secondly, here is a test to demonstrate the different energy of different crystal wands. Get three crystal wands: one made of clear quartz, one made of snowflake obsidian and one made of amethyst. Using the rounded end of one of the wands gently massage the cheek, outer mouth, and chin of a friend that has cold feet for two to three minutes. Wait 10 minutes then repeat with the second wand. Again wait 10 minutes and repeat the massage with the third wand. You will find that no matter what order you use, the snowflake obsidian wand will make their feet feel warmer faster. Or here is a third test. Get two wands. One of bloodstone and one of red jasper. Find someone with a sore back. (They are very easy to find!). Gently run the rounded end of one of the wands in an upward stroke alternating on each side of the backbone for 3 - 5 minutes. Repeat 10 minutes later with the other wand. You will invariably find that the bloodstone wand offers much more immediate and longer lasting relief. Now you know that crystal wand massage works and you know you can do it. So it's time to get a starter kit and let's get on with learning some effective techniques. Go ahead -order your Crystal Massage Starter Kit and get it delivered. I will wait..
Let's watch another video, and then let's get to it.